At that point Fionn already had logged a good many hours watching for the eagles with crowds of other twitchers, looking through scopes or binoculars and discussing the latest developments on and around Bushy Island. When, for a school project, he was asked to interview someone whose career he admired, he chose Nigel Beers Smith, the man who ended up devoting six months to documenting with his camera the daily progress of Ireland’s First White Tailed Sea Eagles in over 100 years. 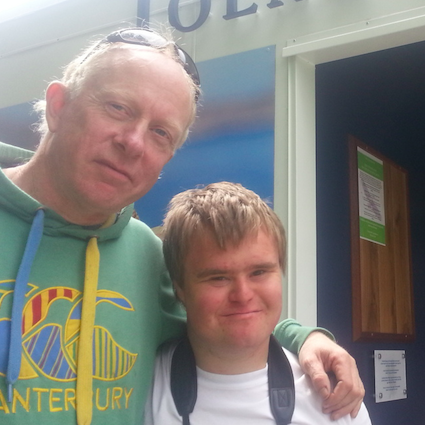 But the man who was most inspiring to Fionn, of course, is Dr. Allan Mee, Sea Eagle reintroduction project manager. As luck would have it, Fionn attended his first talk by Allan in February of 2012, just a few weeks before the pair settled in Mountshannon Harbour. This presentation was to an audience of nature lovers who gathered at the Mulkear Life project in Limerick. Allan reported that there had been frequent recent sightings of one or more eagles in the lower Loch Derg area, and that it was entirely possible that a breeding pair would establish itself in the region. Allan offered to support his school presentation work with boundless generosity, making available research findings and photos, advising on presentation techniques and even donating posters, workbooks and relics, such as an eagle’s feather with a radio transmitter attached. This caring interest in Fionn’s efforts doubled his enthusiasm and self belief. Another big boost was Fionn’s appearance on RTE’s Saturday Night Show in October of 2013. Although he and Jonathan, his dad, had been invited on to discuss a video project they had recently completed on the theme of Social Inclusion, they made a point of mentioning their interest in the eagles, and their good fortune of having the first nesting pair on their doorstep. The producers later confirmed that this segment had been watched by around 250,000 people, so quite a few people first heard the good news this way. During a nature walk with a new pair of binoculars, Fionn recently discovered another breeding pair of White Tailed Sea Eagles elsewhere in Ireland. Because the location is sensitive, and exposure might jeopardise their success, he has been sworn to secrecy as to their location. Now that Fionn has graduated from Scariff Community College, he plans to take a year out before going on to further formal studies. Soon he’ll be helping the Irish Whale and Dolphin Group with an ocean survey of the bottlenose dolphin population off the Connemara Coast. When summer holidays end, he intends to offer more classroom presentations to schools locally and nationwide. And he’s looking forward to seeing the new chick flying soon.